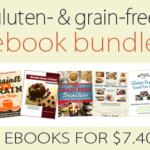 Going gluten- & grain-free can be overwhelming for families dealing with gluten-intolerance or Celiac disease, and this collection includes more than 275 gluten-free and grain-free recipes plus a wealth of information and tips from the authors’ own experiences. And all at a savings of more than 80%! But hurry because it’s only available for 24 hours, starting Friday, 9/6 at 8 a.m. ET. Grain-free doesn’t have to be boring. In fact, it can include all kinds of interesting flavors, spices, and even sauces. Against the Grain is a cookbook full of delicious, fun to eat, whole food recipes that are grain-free — and mostly dairy-free and GAPS-friendly. You’ll even find a few bread and dessert recipes to satisfy your sweet tooth! In Beyond Grain & Dairy, Starlene shares 113 grain-free recipes that contain no grains, no gluten, no dairy, no soy, no corn, no gums and no processed sugars. With full-color photos and a handy ingredients index to help you find recipes by ingredient, Starlene has put together a cookbook to show you that there’s no reason to feel deprived! Going grain-free doesn’t mean you have to give up tasty snacks, and in this brand new ebook, Carol offers more than 45+ homemade, grain-free recipes — everything from gluten-free dorito chips, crackers and cookies to ice cream, frozen treats and mini pizzas. Cara has helped people from all over the world enjoy their grain-free transition with her meal plans, and she’s now packaged the best of her menu planning service in a helpful, full-color cookbook. With more than 70 child-friendly, easy-to-follow recipes for busy households, this ebook makes going gluten-free fun and exciting rather than stressful and overwhelming. Filled with tips and information to help you to eat gluten-free or serve gluten-free meals and snacks to family members and friends who have special dietary needs, Gluten Free and Good for You is both a handbook and a cookbook that uses basic, everyday ingredients that you’re likely to have on hand in your kitchen. Laura and Kim make gluten-free cooking accessible for every family! 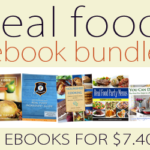 The Gluten-Free and Grain-Free bundle is only available through 8am EST on Friday, 9/7. Get yours today!!! 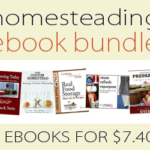 Homesteading eBook Bundle ~ 5 ebooks for only $7.40!!! !